One of Malaysia-Thailand border states. What to do there? For your trip to Kelantan, you can expect a good mix of traditional Kelantanese Malay culture and Siamese influence through all your tourism experiences here in this humble state. 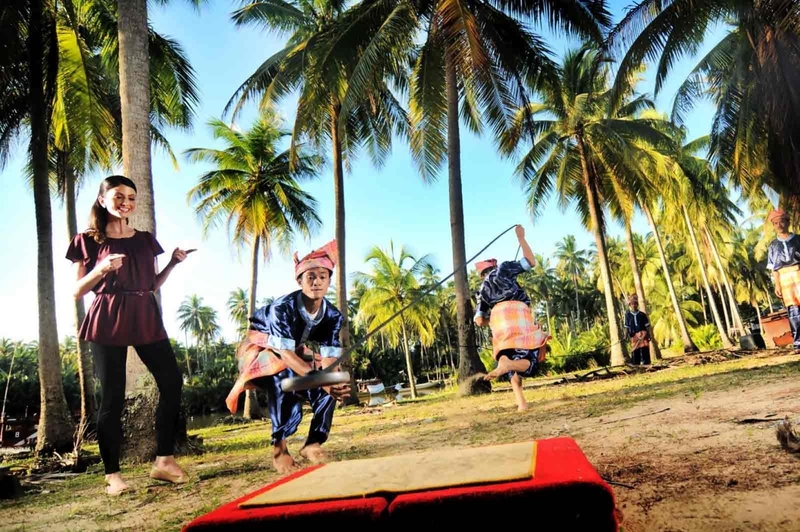 From art experiences, traditional games to food - travellers can seek the best of Malay Islamic culture here in the northeast state of Peninsular Malaysia. Let’s start with some of the art and cultural experiences. Kelantan is known for a famous local Malay art named Wau Bulan (moon kite). Kite-crafting is something that every art enthusiast should experience here in Kelantan. Join a kite-making workshop and create your own wau or kite at Galeri Wau Pak Sapi in Kota Bharu. Or, watch a cultural shadow play show known as Wayang Kulit at Gelanggang Seni in Kota Bharu. The Wayang Kulit is told based on legendary folk stories and is actioned by a puppet master. It’s a great exposure for your children as the stories have moral values. There are also other cultural performances such as silat (Malay martial art) and traditional games such as gasing uri (top spinning) held in Gelanggang Seni where you can participate too! Majority populated by Muslims, it’s easy to find Halal food in Kelantan. Be sure to indulge in the extensive and truly authentic food experience in the capital city of Kota Bharu. It is no doubt that famous Kelantanese cuisine such as Nasi Kerabu, Laksam and Somtam can be found in other states in Malaysia too, but surely they will not taste as good as they are here in Kelantan. For breakfast, it’s a must to try Roti Titab and have a cup of Honey Teh Tarik. If you love cakes or desserts, try the traditional Kelantanese cakes such as Akok and Lompat Tikam. It can easily be found at the local street hawkers during hi-tea. Known to be famous among Malaysians Muslims, Kelantan is a place where the students were sent to learn in-depth Islamic studies. Many graduates of Islamic studies from Egypt, Saudi Arabia and Jordan also used to live here. Plenty of schools and Islamic classes are held around town if you are interested to gain more knowledge on the religion. What to see there? As a cultural town, the well-preserved historical attractions has helped to build the state’s identity. Visit the historical building of Istana Jahar to understand Malay traditions as well as to see various cultural items and memorabilia on display in Muzium Adat Istiadat. At the back of the building is where you can find Balai Senjata, a gallery displaying Malay traditional swords and weapons such as the famous Kris (keris in local) and lembing (a throwing weapon). It is best to explore the heritage trails here by marking the attractions that you wish to visit as some of them are located in the same area. Do include War Museum in your plan as it’s worth the trip. Located in Padang Merdeka, the memorial is dedicated to the World War II as it used to be the headquarters for Japanese secret police during Japanese invasion of Malaya. Make your way to a classic designed mosque, the Muhammadi Mosque located in Jalan Sultanah Zainab for some photography opportunities and a quick tour. For sightseeing and a leisure visit, get to Menara Tinjau and experience watching sunset overlooking Kelantan River at best. Another interesting place in Kota Bharu is the Bird-Singing Field, where you can witness beautiful birds chirping to a melodic tune of nature. Occasionally, bird singing contests are held here too where the locals join and gather every Friday and Saturday mornings. Travellers can also enjoy a great shopping experience in Kelantan. From fresh local produces, street food, clothing, housewares, authentic handicrafts and affordable souvenirs, there’s plenty to find at the multi-level indoor market of Pasar Besar Siti Khadijah. To shop for higher quality local textiles, you can also visit Nordin Batik & Craft - a place for shoppers who wish to custom their own traditional clothes, dresses or tops as it offers plenty of designs. What to eat? Ayam Percik (roasted spice chicken. Main dishes such as Nasi Kerabu, Nasi Dagang, Nasi Ulam, Nasi Tumpang and Nasi Air (local porridge). Traditional cakes such as Lompat Tikam, Akok and Mango Sticky Rice (pulut mangga). The Kelantanese dialect of Malay is quite incomprehensible to outsiders. it's important to respect local mores, especially if you head out into the countryside. It is not necessary or expected for non-Muslim women to wear a headscarf (though it would certainly meet with approval), but both men and women should wear clothing that covers all or at least most of their legs (no short shorts), and women should wear blouses or dresses which cover their torso. Tucked away from the fast-paced city lifestyle, part of Kelantan's charm is the fact that it remains an authentic Malay tradition and a laidback lifestyle.